Welcome to Beautiful Bonita Beach and our larger end unit (207) is on the 2nd Floor and just a stone's throw away from the beach. Our Unit 207 has been fully updated during 2014, the Kitchen cabinets and Lanai tiling has been updated in 2018. Imagine this, waking up to a view of three miles of sugar sand beach, the early morning shell seekers are strolling by, pelicans are busy looking for breakfast and the dolphins swim by looking for fun and frolicking in the sparkling water. Later in the day, perhaps after a stroll along the seemingly never ending beach, you can take lunch on the fully screened and glazed lanai. Afterwards, head back to the beach or take the opportunity to laze by the swimming pool, also at the water's edge or, if you are feeling more adventurous, stroll across the road and rent a boat to explore the back bays and gulf waters. Later still, the legendary sunset will leave you breathless; enjoy it from the white sands or from your own beach side lanai. Features: This larger corner end unit apartment offers stunning views both onto the beach and long views up and down the beach. It is beautifully furnished with 2 beds, 2 baths both of which have been renewed in 2014. Enjoy central air conditioning & luxurious comfort along one of the most pristine beachfront locations in Southwest Florida. This part of the coast is a hidden Gem! There is a queen sized sofa bed in the living room enabling up to six person occupation. The spacious kitchen, with Corian worktops, are equipped with every appliance required for either lazy holiday meals, or for that special gourmet feast you may want to prepare. There is a high bar for others to perch upon and keep you entertained whilst you create a luscious feast! The dining room comfortably seats six. Enjoy a full sized laundry room. Each bedroom is supplied with top quality bed linens and towels which we renew regularly at the first hint of wear. Our endeavour is to offer a quality of furnishings and linens which you would expect at your own home. We send the linens out to be professionally laundered to ensure after a long trip you are immersed in quality hotel style bedding for your first sleep. You will also find all of the beach towels you will need for your stay. The master bedroom, has its own walk-in closet and en-suite shower room, has a 40” Sony wall mounted LED TV. There is hi speed internet and WIFI, extended cable TV offering 160+ channels and free telephone to USA & Canada. Beach chairs are stored in your personal external storage unit. PLEASE NOTE THAT IS STRICTLY A NON SMOKING CONDO INCLUDING RESIDENCE ASSOCIATION SMOKING RESTRICTIONS ON THE LANAIS , FRONT WALKWAYS AND AROUND THE POOL. Local Activities : : Golf, tennis, cycling, swimming, snorkelling,diving, boating, sailing, water-skiing, windsurfing, parasailing, jet skiing, boat rentals, fishing and deep-sea fishing, shelling area, are all nearby. Shuffle-board, miniature golf, water parks, amusement parks, nature reserves, shopping, restaurants, live theatre, cinemas, and sightseeing. Bonita Springs with its great variety of restaurants and shops is located halfway between Naples and Fort Myers beach. Some of the best backwater fishing in the country can be found in the thousands of miles of shoreline, countless oyster bars and acres of sea grass, the area also attracts a large number of different species of salt water fish including sought after game fish such as snook, red fish, spotted sea trout, and tarpon. This area is internationally recognized for its marine activities and superlative weather - come see for yourselves. Casa Bonita is only a 20-minute drive from Fort Myers RSW Airport. Shopping and Restaurants: Within 2 miles of your condo, you will find a myriad of waterfront restaurants such as The Big Hickory Seafood and Grill (across the road), Flippers, Coconut Jack’s, and Doc’s to name a few. Head north along the gulf towards Fort Myers beach and you will find plenty more enticing restaurants, cafes and Bistros and night life. Head south about 10 minutes and along route 41 in either direction you will find virtually any type of cuisine that suits your palate. Plenty of places also to order a take away for those who want to enjoy “eating in” at your beautiful unit but don’t feel up to cooking a meal. Quench you retail thirst as the area is abundant with Shopping. Naples is famous for its quality shopping areas from the downtown Third and Fifth avenues, The famous Village on Venetian Bay, Coconut Point with quality shops and restaurants, Miromar outlets are all within striking distance. The new Mercato complex complete with Silverspot cinemas is one of the most comfortable you will ever visit. In short if you haven't yet visited this area of Southwest Florida you will not regret giving it a try. There is good reason why our family have been coming here for the past 40 years! We have been privileged to own a Family Condo on this pristine and unspoilt part of Bonita Beach/ Little Hickory Island for 40 + years. Now, we and our extended family all own properties along the beach and continue to enjoy this magical place. It keeps getting better and better! You cannot be located any closer to the beautiful white sand beach's along little Hickory Island than you are at CASA BONITA II . Each of our Units have been luxuriously appointed creating a home away from home which our guests enjoy returning to year after year. If this unit is not available please look up our sister end Unit number 201 on the same floor also as beautifully appointed as 207 . Bathrooms are fully modernized, please view the photos . Standing on the Lanai, feels as if you are standing on the sand! End unit affords incredible views directly on the gulf and far reaching views down the beach. The photos from the lanai, as lovely as they look, do not do justice to how intimate you feel with the sea from this unit. You can't get closer to the Gulf than this ! WE ARE ALWAYS UPDATING OUR LINENS AND PROVIDE TOP QUALITY TOWELS AND SHEETS. ON YOUR ARRIVAL ALL SHEETS ON THE BEDS HAVE BEEN PROFESSIONALLY LAUNDERED AND PRESSED. FULLY EQUIPPED KITCHEN, WE ARE FOODIE PEOPLE AND HOPEFULLY HAVE NOT FORGOTTEN ANY GADGETS! Our LARGER End unit apartments both contain lovely comfortable and spacious Dining areas as shown in the photos . (2) In Living Room and new Sony LED in (207) master bedroom with COMCAST EXTENDED CABLE INCLUDED. 201 has a large television in living room and one in each guest bedroom. Our guests kindly leave various books in the apartment and in the social room of the building, thier is a large bookcase for others to enjoy. Bonita Springs is a "Pearl" , you want to return to. The apartment is perfect, the location is perfect, just a few steps from a beautiful Beach. When you take the først step to the aparment, you feel welcome, the aparment has everything you need, and if you need help, we can contact a local person. The property is a very friendly place, we met som real nice people. It is a place, where we can relaxe and the apartment is close to adventures and shopping. We are looking forward to return to the aparment in Bonita Springs. Lovely, comfortable home for a month in "paradise", already pencilled in or 2017. Sooty Wokingham, Royal Berkshire, England. The condominium was beautifully prepared on arrival, and the most comfortable we have had for many years. The location is perfect, just a few steps to the beach, and undercover car park.. The property is the most friendly place, we met some real nice people, and made some new American friends. Daniel has all eventualities covered, and a local person on hand to help with any day to day problems that may arise, pleased to say we had none, so relaxing, now looking forward to next October, and many more years to follow. My wife and I are currently staying in this beautiful Gulf Front condo in Bonita Springs. We love this place! It is everything we expected and more, only the photos do not do it justice. The condo is nicely appointed and has everything you need to cook meals in its excellent kitchen. 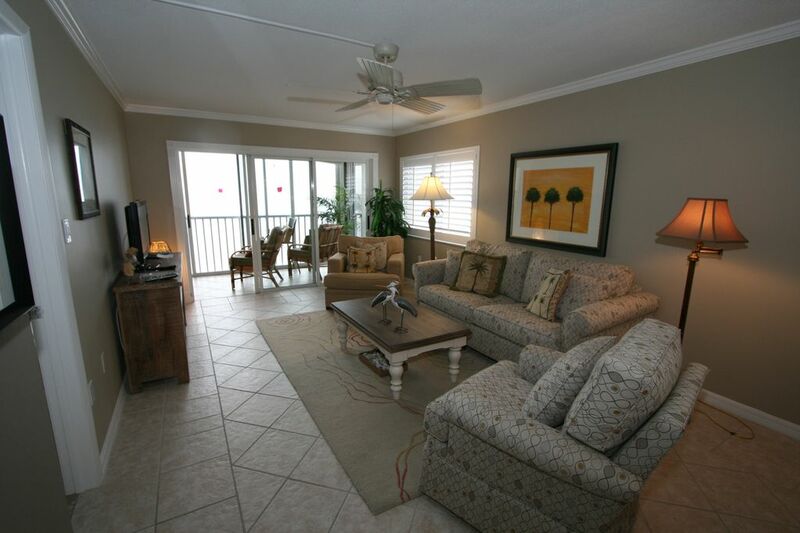 The lanai is awesome and provides sweeping vistas of the Gulf of Mexico. We fall asleep each night to the rhythm of the waves on the beach. This place is paradise. The owners are very accommodating and great to deal with. We would certainly come rent this condo again. RENTALS ONLY ON A CALENDAR MONTHLY BASIS UNLESS OTHERWISE AGREED WITH OWNER. THE APARTMENT LANAI AND FRONT WALKWAY ARE STRICTLY NO SMOKING. RESIDENCE ASSOCIATION REGULATIONS ALLOW MINIMUM ONE MONTH RENTALS ONLY.